The Broadcast Pioneers of Colorado proudly announces a new award designed to honor esteemed broadcasters with Colorado roots that made significant contributions to broadcasting nationwide after their years in Colorado. Lowell Thomas (1892-1981) grew up in Colorado and graduated from the University of Denver. He gained nationwide fame as a journalist, author, radio broadcaster and the narrator of Fox Movietone News. The son of longtime Denver broadcaster Ed Scott, Jon Scott began his career working for his father's radio station, KLAK. After receiving his degree from the University of Missouri, he returned to Colorado reporting for KUSA-TV Channel 9 where he was the northern bureau reporter. 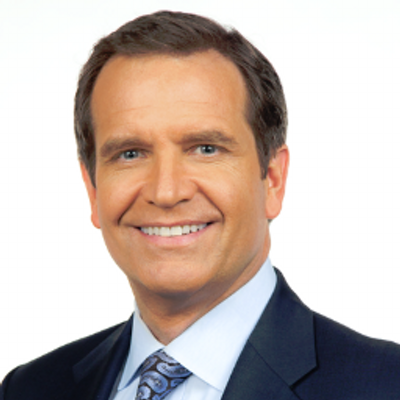 His career took him to Miami where he performed reporting and anchoring duties at WPLG-TV, and then to New York, where he was a correspondent on Dateline NBC where he won an Emmy for newswriting. He also anchored the syndicated newsmagazine Inside Edition. He was one of the original anchors when the Fox News Channel launched. He was on the air during the September 11, 2001 terror attacks in New York City and anchored Fox News' coverage throughout that day, including the moment when the second plane hit the World Trade Center live during his broadcast. During his tenure with the network, he has anchored coverage on the wars in Iraq and Afghanistan, natural disasters, space shuttle launches and several national elections. He currently co-anchors with Jenna Lee Happening Now, a daytime newscast. Away from work, he is an avid private pilot and outdoorsman. He is an avid supporter of causes relating to the U.S. Military and frequently speaks to military and veterans groups. His son is a West Point graduate who has served in Afghanistan. She ventured west to the University of Denver for her BA in Radio, Television and Theatre. While a student at DU, she was hired by Ed Scott (Hall of Fame 2000) to serve as his assistant on the Sheriff Scotty Show on KLZ. She then played the role of “Candy” on “The Candy and Dandy” children’s show. In 1959, Ann headed to New York to see what network television had to offer. At the CBS Production Center, she introduced herself to Allen Funt, producer of Candid Camera. He hired her as his secretary, but soon rose to Associate Producer. Her duties included writing, casting, location arrangements and supervision of film crews and editing. In 1968, she supervised the reversioning of 120 Candid Camera shows for syndication. She moved to the staff of Bob Banner Associates where she created film segments for the Kraft Music Hall program, and specials including “Peggy Fleming at Madison Square Garden.” She also produced film segments for Sesame Street with Jim Henson and Frank Oz. She worked with many notables, including President Harry S Truman, Van Johnson, Carol Burnett and Buster Keaton. In 1974, Ann returned to Denver to serve as Alumni Director for the University of Denver. Following that service, she continues to be an active volunteer at DU. Through her work at DU, Ann had the opportunity to meet Lowell Thomas. The Broadcast Pioneers of Colorado are proud to recognize Ann Richardson’s outstanding contributions to broadcasting on a national level with the 2014 Lowell Thomas Award. In August of 1900, eight year old Lowell Thomas moved from Ohio to Victor, Colorado with his family. Hired to work at the Victor Daily Record two years later, Thomas folded then delivered the morning paper to the business and red light districts of Victor and Goldfield and made it to school in time each morning. He would become editor of the newspaper before going awayto college at Valparaiso in Indiana (B.S. 1911) and the University of Denver (B.A. and Masters, 1912). He then began writing for the Chicago Tribune and was on the faculty at the Chicago Kent College of Law. In 1916 he received yet another degree from Princeton, where he also taught. He traveled widely, writing articles about the virtues of rail travel. He was selected to head a national “See America First” promotional program. But a month later on his 25th birthday, the United States declared war on Germany and her allies and “America First” was canceled. With authorization from President Wilson, the U.S. War Department asked Thomas to gather material and stories that “would encourage the American people’s support” for the war. Thomas wanted to film it, and he gained private funding to do so. His travels eventually took him to the Middle East, where he was among the first reporters to cover the exploits of T.E. Lawrence, the British captain immortalized in the film Lawrence of Arabia decades later. Thomas wrote a book, With Lawrence in Arabia (1924), about his time in the desert and Lawrence’s exploits during the war. It would be the first of 56 books he penned. In March of 1925 he spoke for the first time on radio. He worked at Pittsburgh’s pioneering radio station KDKA before joining CBS. Thomas hosted a regular radio broadcast “Lowell Thomas and the News” through five decades. His “sign off, “So long, until tomorrow!”,. became the title of his autobiography. Thomas delivered the first regularly scheduled TV news broadcast in 1940. He covered the 1952, 1956 and 1960 political conventions. For 17 years he narrated newsreels for Fox Movietone News. From 1957 to 1959 Thomas was on the television set acting out his series High Adventure introducing the peoples and customs of remote lands. He also made the first three Cinerama (three-dimensional) movies. In 1976 President Gerald Ford presented Thomas with the Medal of Freedom and that same year Thomas told the world, from Victor, Colorado, that he was retiring from broadcasting. So varied was his life and pursuits that his autobiography is classified as “biography of a subject who doesn’t fit into any other category” by the Library of Congress. The Broadcast Pioneers of Colorado awards the late Lowell Thomas the award we name in his honor... The Broadcast Pioneers of Colorado Lowell Thomas Award.